Choose Window > Score Manager (or press COMMAND+K). The Score Manager is a resizable floating window that allows you to view, edit, reorder, and delete score Instruments, including mid-score instrument changes. This includes the ability to change staff settings, including the first clef, transposition, notation style (percussion/tablature), and others. The Score Manager also allows you to assign Audio Units and MIDI sounds. These staff and sound assignment options are available under the Instrument List tab. To resize the Score Manager window, click and drag the lower right corner. The Score Manager also includes a File Info tab with options that allow you to include information about the score, define standard text like the title and composer, and view file statistics. As a modeless, floating window, changes made in the Score Manager apply instantly to the score. All of Finale's menu commands remain available when the Score Manager is open. The Instrument List tab of the Score Manager includes two portions: the list of Instruments in the top portion, and the staff settings below. The list includes an expandable row for each Instrument in the score. If the Instrument contains more than one staff, such as a piano grand staff, click the to the left of the Name to expand the row, showing the individual staves. 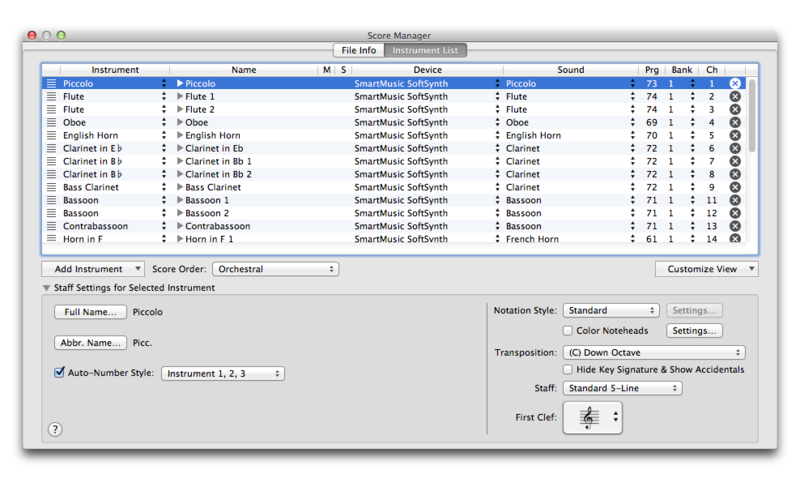 Click an individual Instrument (directly on the Name) to activate the settings in the lower portion of this window, which can be used to edit the staff properties, such as the clef or notation style. Click the to the left of any staff name to display the individual layers, chords, expressions, and mid-score instrument changes. (Individual staves, layers, expressions, and chords in mid-score instrument changes are not available for editing). The several columns of the Score Manager also allow you to adjust mixer settings (mute/solo/pan) and assign (Audio Units or MIDI) sounds to Instruments. These settings can be assigned to Instrument's layers, chords, expressions, and mid-score instrument changes. Use the popup menu to select the available columns. See Instruments for more details regarding how to manage Finale's Instruments in the Score Manager. Noteman says: The available columns change depending on whether you are using MIDI or Audio Units for playback. Name. This is the Full Staff Name of the Instrument (as defined in the lower portion of the Score Manager). R (Record). A Record (R) column that specifies which Instruments or layers will be recorded into, with the HyperScribe Tool, always appears. When the Record column is blank, no staves (or layers) of staves are selected to record into. Click in the R column next to the staff you want Finale to record into. A red circle appears in the R column, indicating that Finale is set to record into the active layer of that staff. You can also record into a particular layer of a staff. First expand the staff by clicking the down arrow next to the Name; Layer 1 through Layer 4 appears. If the staff is selected to record into (a red circle appears in the R column for the staff name), a small red circle indicates the layer that will be recorded into. If you change the current layer using the Layer Controls, the small red circle moves to reflect the current layer that will be recorded into. To specify a particular layer to record into, click in the R column next to the layer of the staff you want Finale to record into. Note that you cannot record chords or expressions in an expanded staff; Finale ignores any clicks in the R column for chords and expressions. If you’re not multitrack recording (Record into One Staff or Split into Two Staves is selected in the Record Mode submenu of the HyperScribe menu), you don’t need to use the Score Manager to specify which staff to record into; simply click the staff in the score that you want to record into. If, however, you prefer to use the Playback Control’s Record button (instead of clicking a measure in the score), then you must use the R column in Score Manager to indicate the staff or layer to record into. Click in the R column next to the staff or layer you want Finale to record into. Click on a different staff or layer to select it instead. The red circle moves to the staff or layer you clicked. If you are multitrack recording (Multitrack Record is selected in the Record Mode submenu of the HyperScribe menu), click in the R column next to the staff or layer you want Finale to record into. Click the R column to select additional staves or layers to record into. Click again to remove the triangle (so Finale won’t record into the staff or layer). In an expanded staff list, a small red circle shows the default layer that is enabled for recording. If you specify one or more layers of a staff to record into (for multitrack recording only), a circle with a small red dot will appear in the R column for the staff name to indicate that one or more layers will be recorded into for the staff. The dotted circle also appears in a collapsed list so you can immediately see, without expanding the staff, that one or more layers will be recorded into. Noteman says: If you’re using multitrack recording, you must set up the R and RChan columns in Score Manager for each staff (or layer) you want to record into. M (Mute). In this column, a gray circle appears across from the name of each staff that you want to mute when you play your score. By clicking in this column across from a certain staff, you make the circle disappear, indicating that the staff will sound when you play the score. If you’ve expanded a staff to view its individual layer assignments, and you turn on the Mute setting for some layers but not others, the circle in the Mute column will be white with a small gray dot. That is your signal that the individual layers of the staff have mixed settings in the Mute column. Note that the Playback check box in Document Options - Layers provides the same function. S (Solo). When you click in the Solo column across from a staff name, a green circle appears. You’ve just isolated a staff so that only it will play back, and all the other staves are silent. You can solo more than one staff, if you wish—for example, you can solo two or three staves, and all the others will be silent. In fact, you can solo all staves, although there wouldn’t be much point, because you may as well solo none of them. Noteman says: If a dot appears in the Solo column, only the soloed staves (or instruments) will play back. Noteman says: If the sound listed here doesn't match the playback sound, or if the playback sound is incorrect, this could have been caused by moving files across platforms and back. For example, if you created a document on Windows, then moved it to a Mac and changed some sound assignments in the Score Manager, then saved and reopened it on Windows, Finale displays the sounds you defined on your Mac in the Score Manager. But, at the same time, Finale has remembered the original sound configuration, and plays the sounds as they were originally assigned on Windows. If you don't notice any incorrect sounds during playback, you can leave the assignments alone (with the incorrect display in the Score Manager) in order to transfer back to the other platform without needing to change sound assignments again. If you hear the wrong sounds for one or more Instruments during playback, a change to the channel assignments were required when you assigned sounds on the other platform, which prevents Finale from being able to restore the original sound configuration. If this is the case, simply choose the correct sound for the Instrument under the Sound column in the Score Manager to resolve. Sound. This column lists the playback sound, when available. If you are playing through Audio Units and a Sound Map is selected for the Device, this column lists the name of the sound sample in the selected Sound Map. (If you are using a 3rd party Audio Units sound library, "Edit Player" appears, which you can click to reference and change the sound set to the specified Finale channel. See To assign 3rd party Audio Units sounds to instruments.) If you are playing Finale through MIDI, this column displays the General MIDI instrument (or equivalent). You can click the arrow and choose from the complete list of General MIDI sounds. Click the arrow and choose Edit Patch to open the Set Patch To dialog box where you can assign Program data for playback through an external MIDI device. See To establish MIDI sound settings for a score Instrument. If a device uses midnam files, the Sound popup menu will display banks and sounds for the device associated with the midnam file. To use midnam files, see Configuring a new device in Audio MIDI Setup. If SmartMusic SoftSynth is selected, to select percussion, choose "MakeMusic GM : Bank 128." (See also Percussion MIDI Maps: SmartMusic SoftSynth). Percussion MIDI Map. From this popup menu, choose the desired percussion MIDI map for playback. Add Instrument. This button is available while viewing the score (Document > Edit Score). (Instruments that have been added can be introduced to parts in the Manage Parts dialog box). When you click this button, a three-tiered menu appears displaying the available 1) Instrument types, 2) families, and 3) individual instruments. (Optional) Select a type from the leftmost list to concentrate the list of families and Instruments to include only those of the selected type (or leave All selected to show all Instruments). Click a family to view its Instruments. Double-click an Instrument to add it to the score. Once you have added an Instrument, its type and family are selected automatically the next time you add an Instrument. (This allows you to easily enter multiple Instruments in the same family, one after another). Instruments are added according to the selected Score Order. If the Score Order is “Custom,” Instruments are inserted below the currently selected row. To add an Instrument to the top of a score when Custom is selected, add the Instrument, then click and drag its icon up to the top of the list. (See Reordering Instrument Staves.) To define a custom Instrument, choose Blank Staff > Blank Staff, then use the options in the lower portion of the Score Manager, and the Staff Attributes, to define the Instrument properties. Score Order. This popup menu is available when viewing the full score (Document > Edit Score). Use this menu to select a standard score order for your instruments. Instruments in your document will reorder immediately after you select a new Score Order. The Score Order selected in this menu is applied whenever new instruments are added to the document, and changes to “Custom” automatically if you manually adjust the order of your instruments. Color Noteheads • Settings. Check this box to use color noteheads in the staff. Finale's colored noteheads were designed for use with Boomwhackers® methods. Click Define to open Document Options - Notes and Rests where you can customize the color of each pitch. Hide key signature & show all accidentals. Check this box to always hide the key signature for the selected instrument, in favor of automatically showing accidentals. This overrides the corresponding setting of any key signatures applied to regions in the score on that instrument. Staff: Standard 5-line • 1-line with Full Barline • 1-line with Short Barline • 0-line with Full Barline • Other. Choose from four commonly-used staves, or choose Other to display the Staff Setup dialog box, in which you can specify a custom staff. See Staff Setup dialog box. First Clef • Select. This display identifies the clef that will appear at the beginning of the staff. To change this clef, click Select. The Clef Selection dialog box is displayed with Finale’s eighteen default clefs. Double-click the one you want; you return to the Score Manager, where Finale displays the clef you clicked. 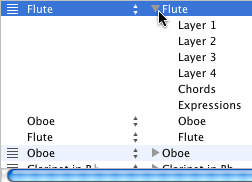 Auto-Number Style 1,2,3.… Check this box to automatically number instruments in score sections (Flute 1, Flute 2, etc.). Choose the desired number style from the popup menu. The File Info tab of the Score Manager includes important information about your document including title, composer, copyright information, and document description. Some of this information, like the title and composer, appears directly in your score as a text insert. (See Text menu.) You can type any file-specific information that you may want to refer to later on. If you’re sending the file to a publisher, for example, you might use the file description area to communicate information about the fonts that were used in the file. Below the document description you can enter the initials of the file’s creator and modifier. 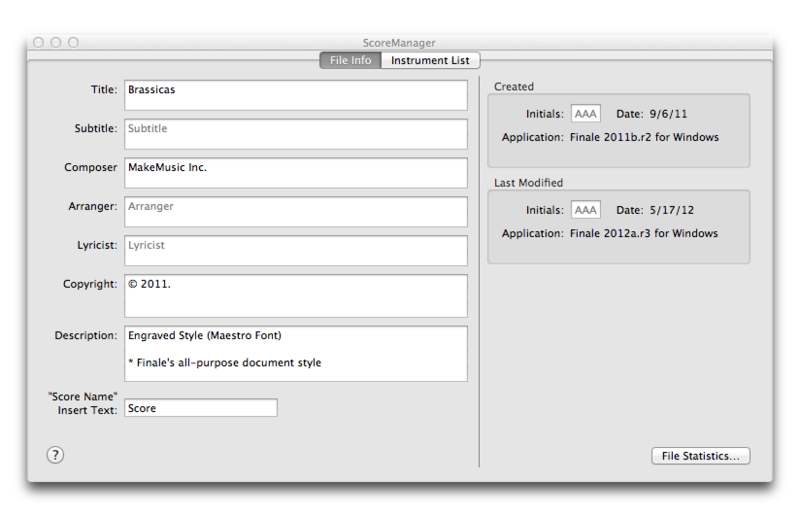 Finale automatically provides the creation and modification dates, the name of the application (Finale), the platform (Mac or Windows) that created the file, and the application version number.